In every dispensation of time we find ourselves under circumstances that have evolved-and under said circumstances our language must too evolve to describe and convey our present reality that our demonstration remain on time- within the time and environment that we are addressing. We’ve been applying the term grass root activism to describe our reality and though it is not my position that we defenestrate said terminology- I do realize that we must evolve in terminology that we may accurately define our present reality. The reality is that we are in a dispensation of time wherein we are faced with community deterioration and mass incarceration and these social ills are both systemic and concrete in the social psyche of our country. 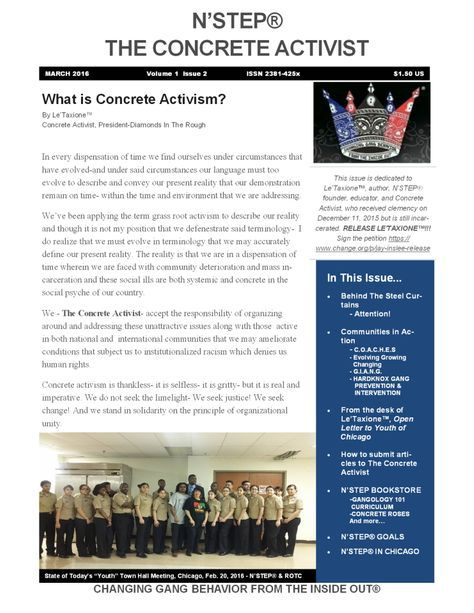 We - The Concrete Activist- accept the responsibility of organizing around and addressing these unattractive issues along with those active in both national and international communities that we may ameliorate conditions that subject us to institutionalized racism which denies us human rights. Concrete activism is thankless- it is selfless- it is gritty- but it is real and imperative. We do not seek the limelight- We seek justice! We seek change! And we stand in solidarity on the principle of organizational unity.